is an (R)SAB(s)b barred spiral some 35,000 light-years across, and 40,000,000 ly distant. This beautiful Seyfert galaxy is of the starburst type, characterized by vigorous star formation as evidenced by the jets of hydrogen and dust spewing from its active core. NGC 1808, a prominent radio source, is distinguished by its complex, seemingly multiple nuclei, and lovely but warped dim outer arms. 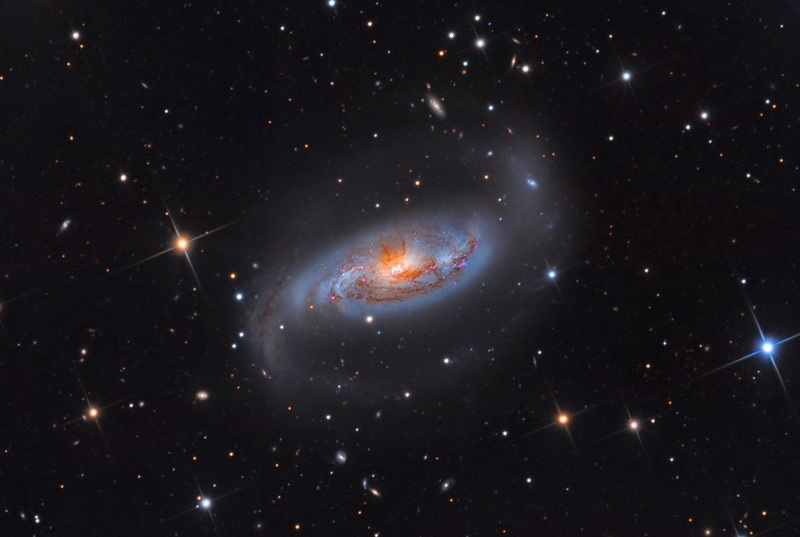 I am very pleased to have collaborated with my observing partner Dr. Steve Mazlin who produced this wonderfully detailed luminance, while I provided the chrominance. This data was acquired in 2012 at SSRO.